The closing ceremony of The Arctic: Mirror of Life took place within a beautiful ice fjord, amidst stunning green rolling mountains dotted with colourful houses. Minik Rosing began with an entertaining talk about the traditional innuit costume, its materials and history. Speakers from Qassiarsuk, HE Sophie Petersen, His All Holiness and Mrs Maria Beckett also addressed the symposium. 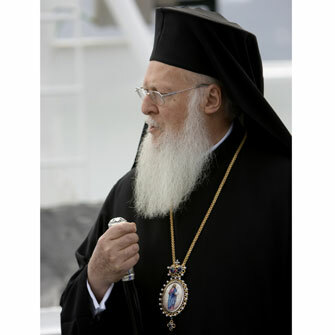 HE Sophie Petersen thanked HAH Patriarch Bartholomew for his courage, and also thanked the organisers and sent the visitors away with a wonderful message to 'bring greetings from our hearts to all of your loved ones'. Time is short. The Ice of the Arctic is shrinking at a frightening pace according the scientists and Greenlanders. If all of the ice in Greenland melts the consequences for Greenland and the rest of the world could be devastating. We must act together and act now.